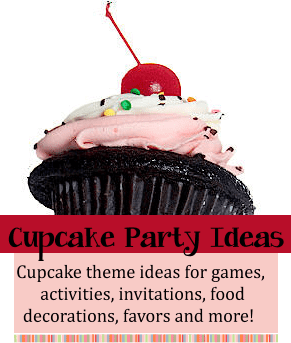 Great Cupcake birthday party ideas sprinkled with fun party games, activities, goodie and party favor ideas. Mix them all together for a great Cupcake birthday party! Buy or make cute cupcake shaped invitations. Fill out the invitation and then include some confetti in the envelope. Buy Mike and Ike candies and stick on large address labels printed with the party information. The Mike and Ikes look like cupcake sprinkles. Print out party information on white paper so that you can cut them out into 1 1/2 x 3" inch strips. Wrap the end of the paper around a toothpick and then glue to secure. Stick the toothpick with the party information into mini cupcakes. Fun decorating ideas for a Cupcake party theme! For the cake table buy a brown tablecloth or buy brown fabric and lay across the table (cupcake). On top of that lay a smaller pink tablecloth (frosting) and then sprinkle confetti or sequins on top for the sprinkles. Cover with a clear plastic tablecloth. Hang white Christmas lights around the room - place brown bow in between the lights. Tie different colored balloons at each chair to look like sprinkles. Piñata’s are always fun and especially when they are cupcake shaped! See our pinata help page for set up and how to play instructions. Homemade recipes for how to make pinatas are also included! Played like Pin the Tail on the Donkey. Make a large cupcake from poster board … or a poster of a cupcake … and hang on the wall. Cut out candles and put double stick tape on the back of each one. (Make sure they are different colors or they place numbers on them so you can tell them apart). Blindfold the guests one at a time and have them try and place their candle on top of the cupcake. Closest to the center wins! Buy or make small colorful beanbags (stuff with rice or pinto beans) about 3”x3”. Set a clean cupcake / muffin baking pan on the floor and place numbers in each cup - the first row would be 1, second row 2, third row 3 and so on. Place a piece of tape on the floor about 4 feet from the cupcake pan and have guests line up behind it. The object is to throw the beanbags (give the first person in line 3 beanbags) into the cupcake pan and try to get the highest score. Total the numbers that the bean bags land in. The beanbags could make a colorful party favor. Buy very large jelly beans or you can use Mike and Ike candies for this relay race. Place a container filled with an equal amount of candies. Divide the guests into two teams and have them line up behind a start mark. Place another container far away from the start mark. Give the first player on each team a wooden spoon and have them balance as many “sprinkles” as they can on the spoon while running to the opposite container. If they drop any they have to bring them all back to the start and place them in the start container. Then the next person in line starts the race. Then first team with all of their “sprinkles” in the opposite container wins. Count the sprinkles to be sure none were dropped during the game. 1, 2, 3, 4, 5, 6, 7, 8, 9, 10, 11, 12, 13, 14, 15, 16, 17 and 18 years old! Decorate photo frames with glitter and sequins to look like sprinkles on the top of a cupcake. Make a huge cupcake birthday cake! Make three 9” layers of cake. Carve the third cake layer into a dome shape, then place on top of the others. Frost on the top with lots of frosting, then place accordion shaped construction paper around the sides (for the cupcake liner). Decorate with large round candies for sprinkles. Set up a cupcake decorating station and let the children decorate several cupcakes each (let them take the extra’s home). Set up bowls full of sprinkles, candies and writing gel. Give each child two or three cupcakes on a paper plate. Place several plastic spoons in each bowl for them to use to spoon out the decorations onto their plate. Have fun seeing all the crazy combinations. Making and baking the cupcakes can also be a fun activity. Depending on the size of the group set up 2 or 3 mixing stations. Divide the cupcake batter recipe so that each group will make about 3 cupcakes each. Buy inexpensive aprons at the craft store and let the children decorate them. Use them when they bake their cupcakes and then let them take them home as a party favor. Cupcake themed candies, lip gloss or makeup sets. The cupcakes extra cupcakes they made at the party and/or the decorated aprons. Mike and Ike candies - they look like sprinkles. Wrap party favors in pretty pink tulle and tie with a brown ribbon. Brown circular box or plastic container - wrap goodies in pink satin material then place face down inside container. The pink satin will look like frosting on a cupcake.